...who takes Maverick Pride to the next level, like Zach Arnold, communication senior and Athletics Department intern. 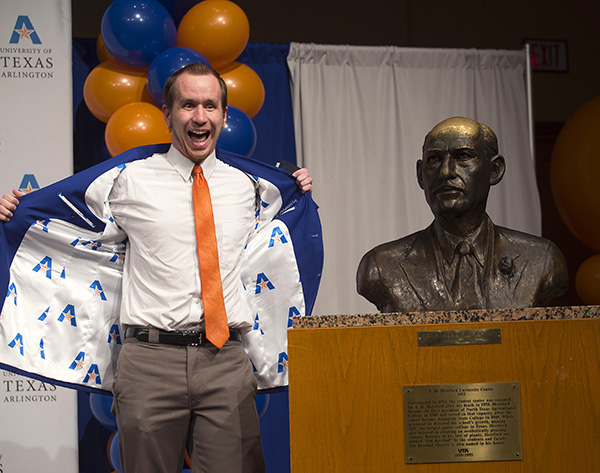 After receiving their class rings, students took the stage to show their pride—and rub the bronze head of former UTA President E.H. Hereford for luck—at the Maverick Ring Ceremony last week. See more photos. The look and design of MyMav and the MyMav sign-in page have changed. While the functions remain the same, you will need to reset your favorites. If you have questions, contact the HelpDesk at helpdesk@uta.edu. Additional tickets for Commencement ceremonies are available to graduation candidates through noon Monday, May 8, while quantities last. To claim tickets, select the appropriate school's or college’s ceremony at utatickets.com. 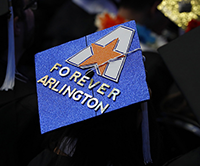 For Commencement details, go to uta.edu/commencement. 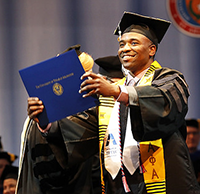 Commencement ceremonies are Thursday-Saturday, May 11-13, at College Park Center. Wednesday, May 3—Digital Scholarship Series: "The Life and Times of S. Carter"